Species Listing Status: The U.S. 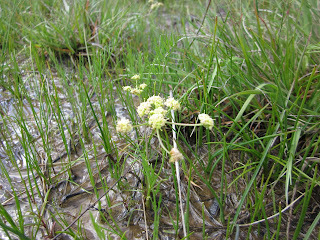 Fish and Wildlife Service and the State of Oregon have listed Lomatium cookii as an endangered species. 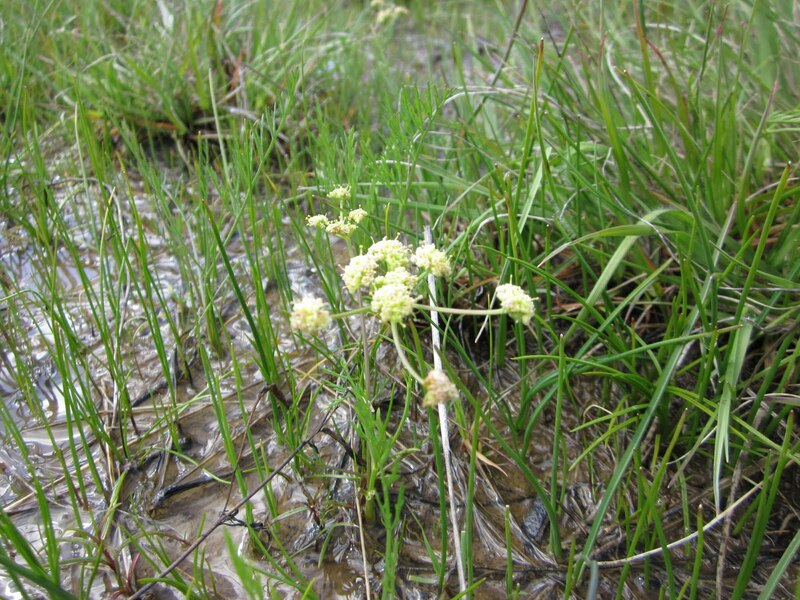 Distribution: Lomatium cookii is a southwestern Oregon endemic found in margins and bottoms of vernal pools and in moist, grassy meadows. It is found only in the Illinois Valley in Josephine County and Agate Desert in Jackson County. Project Description: Monitoring of Lomatium cookii was initiated by the Bureau of Land Management (BLM) in the early 90's and has continued annually. 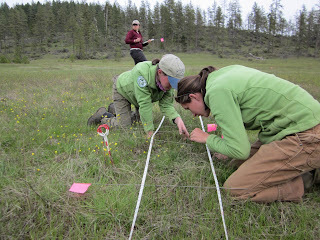 Our work included monitoring density and demography plots to assist with BLM recovery efforts. Based on demographic data collected from 1994 through 2010, a Population Viability Analysis was developed to guide future land management decisions with L. cookii in mind. Ongoing threats to this species include rural development, damage through recreational use and mining activities. Identification Tips: Lomatium cookii is a small perennial that rarely exceeds thirty centimeters in height and is quite inconspicuous unless in flower. The leaves are ternately divided into many narrow leaflets and have a feathery appearance. The creamy yellow inflorescence blooms from mid-March through May and is displayed in a compound umbel on a leafless stem. Interesting Facts: Lomatium cookii can produce several flowering stems per plant. The first umbel's flowers are mostly staminate (male) and subsequent umbels will produce both male and hermaphroditic flowers. The hermaphrodites are only found on the outer edges of umbellets. This reproductive strategy is a protective measure to prevent inbreeding.